Subtitled: Brain, Mind, and Body in the Healing of Trauma. As was probably obvious from the title/subtitle, this is a book of psychology focusing on the physical, mental, and emotional aspects of trauma and how they affect everything in a traumatized person’s life. Note that this review will be, in some ways, very personal. This book was definitely out of my comfort zone, for more than one reason. First, I don’t generally read a lot of nonfiction, especially academic nonfiction. Second, prior to this book, I knew next to nothing about PTSD or trauma psychology. Third, I have recently come to realize, through therapy, that I am suffering from long-term, complex PTSD. While I have had many diagnoses through the years and all of them have rung true in one fashion or another, this is the first time any of my psychological symptoms have made sense in context with the things I lived through, rather than just being “chemical imbalances.” I’d never even considered PTSD as a possible diagnosis prior to my counselor making the statement that many of my symptoms, defenses, reactions, and thought processes were more in line with it than depression/anxiety. The statement was completely unexpected, and I wasn’t sure I could agree with it. I began researching PTSD, specifically a more long-term, chronic kind that isn’t rooted in a single life-altering event. I’m not sure exactly how I stumbled on this book – a facebook link out to an author interview with an excerpt from the book re: yoga and PTSD, I think? However I found it, what I read made a lot of sense, and I immediately requested the full book from the library. 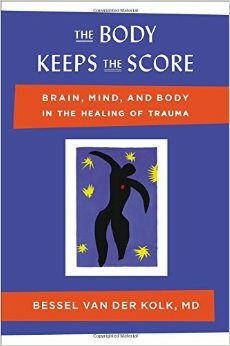 The Body Keeps the Score is ~350 pages long. By the time I was 80 pages in, I’d already flagged over 20 spots I wanted to mark up (and I almost never write in books!). I happened to be by a bookstore at that particular time, and they happened to have one copy of this book left. 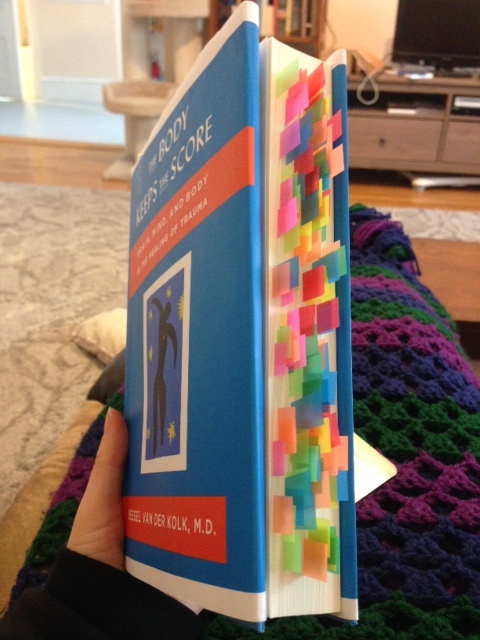 Of course I bought it, then transferred all my post-it flags to my copy (and underlined/circled/etc the things I wanted to note). By the time I reached the end of the book, I had 110 spots/passages marked (see pic –>). I learned a lot from this book. I read other peoples’ stories and behaviors, and recognized my own patterns in them (sometimes with such eerie similarities that I experienced a bizarre out-of-body deja-vu sort of sensation). At times I became so disordered in my thinking while reading – something very unlike me – that I could not focus, and it would take me half an hour to read/process two paragraphs. Sometimes during that disordered reading, I’d stop being able to feel certain parts of my body (hands, particularly), and sometimes different muscles would be so tight/tense that it was impossible to relax them. There was one completely innocuous sketch (depicting the body’s responses to trauma) that was so upsetting to my brain that I had to cover it in order to read the text on that page without having a panic attack. Reading about different experiences of physiological trauma-responses kept my mind splintering off to random parts of my life, even more than reading about the trauma-causes. The more I read, the more I believed my counselor’s observations. I’m not going to go into my personal trauma issues here. That’s not the point of this. My point is that this book helped me to understand a lot about myself that I never saw or understood before. It didn’t “heal” me or anything, of course – that’s also not the point – but gave me ideas about possible directions to go in order to work toward healing. It gave me hope – something I haven’t had in over 25 years now – and that made the book worth reading, difficult or not. There are only two complaints that I have with The Body Keeps the Score. First, there are a few sections that grew extremely biased and political, whereas most of the book was presented fairly scientific and neutral. While I agree with the author’s biases and politics, I feel that moving from a scientific book to a persuasive one undermines the scientific parts and makes them less credible. This, of course, is generally my response to biased nonfiction. Second, while the book talks extensively about chronic childhood trauma in the form of abuse, molestation, and neglect, there is virtually no talk at all about the effects of continual bullying or peer-abuse, which of course is a huge cause of trauma and mental health problems. I would really like to be able to read more research about this second point specifically. I don’t have much else to say. I’m glad, for personal reasons, that I read it, and I think this is a great resource for those interested in understanding the experience of traumatized individuals. This entry was posted in 2015, Adult, Prose, Wellness and tagged health, nonfiction, psychology. Bookmark the permalink. Gosh, good for you for finishing this book. If a book were making me react that strongly physically and mentally, I think I may have had to put it down. I’m glad that it helped elucidate some of your experiences—that must have been so validating! I suffer from chronic anxiety, and I do wonder occasionally if it couldn’t also (or) be PTSD, just from living in a frequently stressful, unstable environment and having abusive relationships growing up. Then again, I don’t want to fall into the trap of self-diagnosis. 😛 Maybe this would be a good book for me to read, too. P.S. Since you’ve mentioned disliking (or being keenly sensitive to) biases in nonfiction, I will say that The Underground Girls *does* veer into that territory at times. I still think it’s an extremely worthwhile book, but I wanted to give you a heads-up. And thanks for the heads up on Underground Girls. I’m not sure how it will affect me. For instance, I don’t mind the bias that’s all the way throughout The Omnivore’s Dilemma, but it bothers me in many books about the Middle East that the culture there is automatically assumed wrong/bad/abusive/etc. I like when it’s presented in a way that is more neutral, and more open-minded (like The Woman Who Fell From the Sky or In the Land of Invisible Women, rather than, say, The Bookseller of Kabul, which I hated with a passion). I’m glad the book worked for you. It’s so important, in my opinion, to have a book that truly speaks to you when you are going through a difficult time, especially when that “time” is highly extended.